Powered by our Triple Confirmation algorithm, Stochastic Divergence Scanner is amazingly accurate at spotting divergence between price and Stochastic oscillator. It weeds out bad trades and gives you the best signals for trend reversals. 3 months ago, I released the Pro Stochastic Divergence indicator. And it quickly became our best-selling indicator. 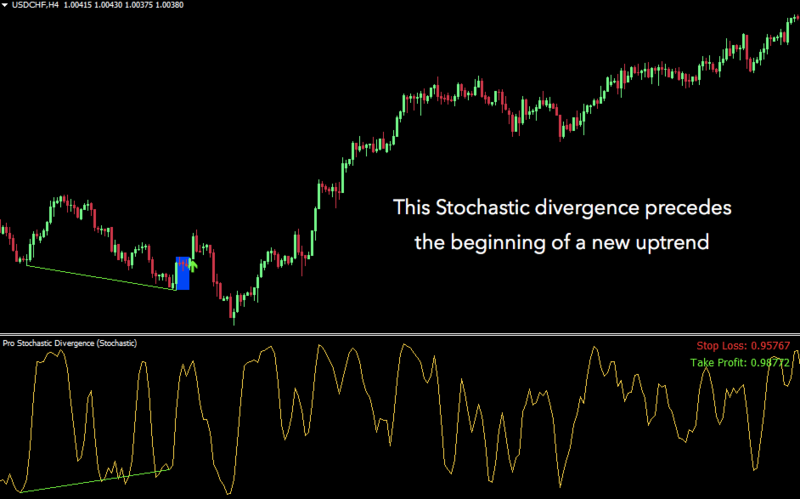 Pro Stochastic Divergence is probably the best reversal indicator ever developed. For the first time, we've successfully combined one of the most time-tested trading strategies of all time AND our unique trading insight & algorithm to create this ULTIMATE trading machine. Our "Pro Stochastic Divergence" indicator detects divergences using Stochastic oscillator (instead of the traditional MACD oscillator that most people use). In our rigorous tests, we found out that using Stochastic to find divergences give you far better results. It provides you with more accurate signals and also filters out a lot of false signals that you'd get with MACD. 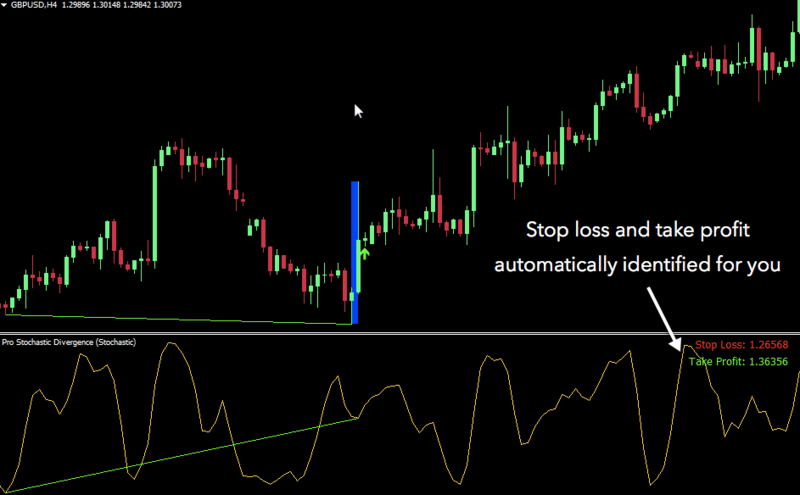 Automatically detect all reversal trade setups based on divergence. In case you didn't know, divergence is one of the most time-tested & proven strategies for trading reversals. The best part is -- divergence is UNIVERSAL. It works in MANY markets across ALL timeframes. In other words, many professionals consider divergence as THE standard method for trading reversals. Triple Confirmation algorithm boosts accuracy. 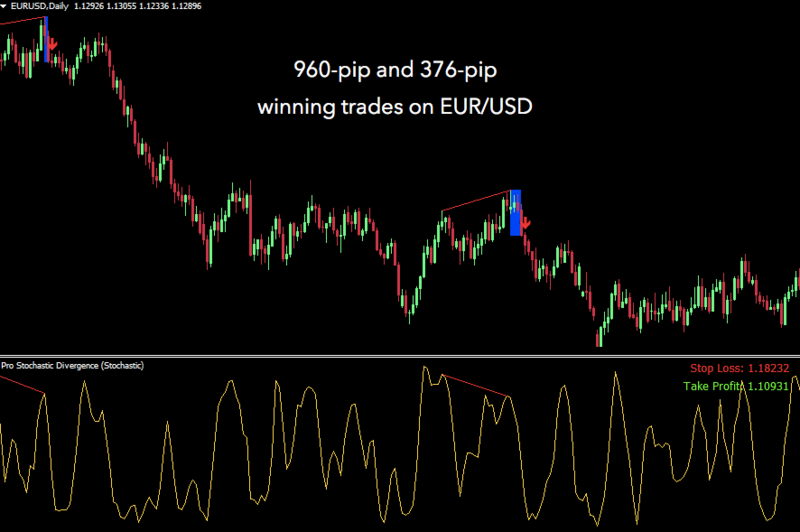 Once all possible trade setups have been found, the Pro Stochastic Divergence indicator uses our patent-pending TRIPLE CONFIRMATION algorithm to rank these trade setups by WINNING PROBABILITY. And then the indicator eliminates most false signals and shows you ONLY the very best trade entries that have the highest probability of winning. Suggested stop loss and take profit printed on your chart. It does all of the hard work for you. You no longer have to guess when to enter or where to set your stop loss & take profit. Everything's taken care of. You don't have to lift a finger. Reward/risk ratio of every trade is 3:1 or better. This way, we make sure that we eliminate most of the risk of trading reversals while retaining ALL the upside of trading reversals (which is its gigantic profit potential). Which means, when you lose, you'll lose only a little. But when you win, you'll win BIG. Weed out false signals, so you'll get the very best trade setups. Notifications, so you won't miss any signal. Plus... you're in total control. 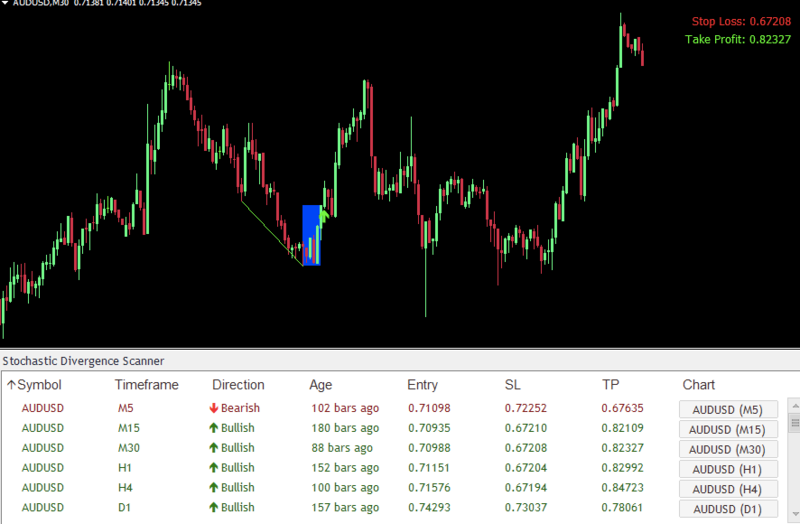 For example, you can change the color of any text, entry, stop loss & take profit. And... you can even set how strict you want the indicator to be. For example, if you'd like to be really strict and want to identify only the highest-probability trade setups, you could easily do so. On the other hand, if you want to get more trade setups, it's also 100% possible. 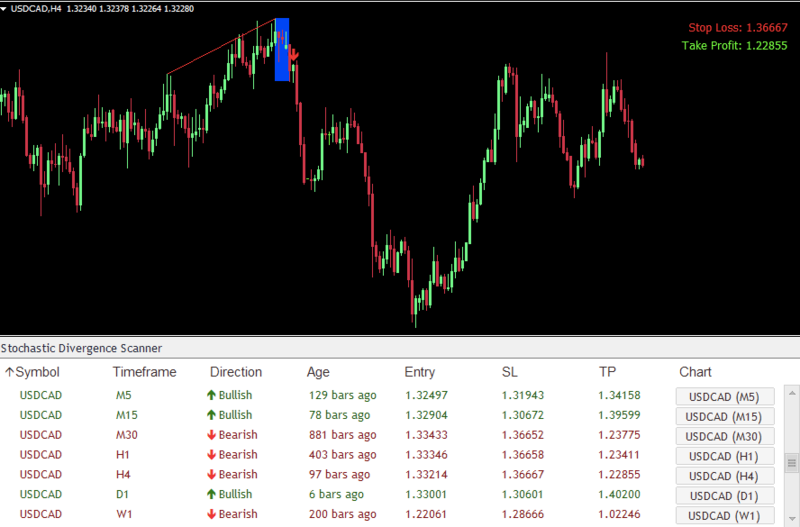 In addition, the indicator is extremely flexible: Works on ANY currency pair... ANY time-frame. So 3 months ago, we released the Pro Stochastic Divergence indicator. Among the emails we received from happy Pro Stochastic Divergence customers, one stands out. He said: "Pro Stochastic Divergence works. No doubt about it. But I trade 10 currency pairs plus gold and S&P500. Takes quite some time to go through each pair to see which trade setups have formed." What if we could apply our world-famous "Scanner" concept and design to those divergence-based trade setups? What if we could develop some kind of Stochastic Divergence Scanner indicator that SCANS all the pairs you want to trade, on ALL time-frames for the highest-probability divergence-based trade setups? I'm happy to say: I'VE DONE IT. The Stochastic Divergence Scanner indicator displays all detected divergence-based trade setups in ONE convenient dashboard. First, it will scan ALL currency pairs and ALL time-frames for the highest-probability divergence-based trade setups you could ever find. And all these calculations are done so fast - literally within seconds - you won't even notice the time. Second, the indicator will display a beautiful dashboard on your chart where you can see exactly what trade setup has recently formed on EVERY pair, EVERY time-frame. With just one look at the scanner, you'll instantly know all the information you need to make a good trading decision. You'll instantly know which trade setup appears on every time-frame (from 1-minute to monthly) and on every currency pair. Not only that, you'll also know the exact direction of that pattern - whether it's bullish or bearish. And you'll know exactly how long ago that particular setup showed up. Remember, you can specify as many pairs as you like. 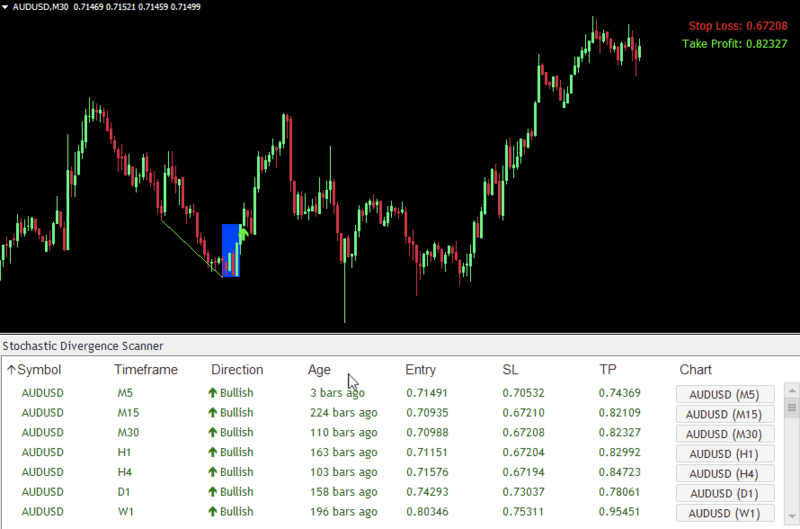 You can also use it for indices, stocks, futures, and gold (anything your broker offers in Metatrader). 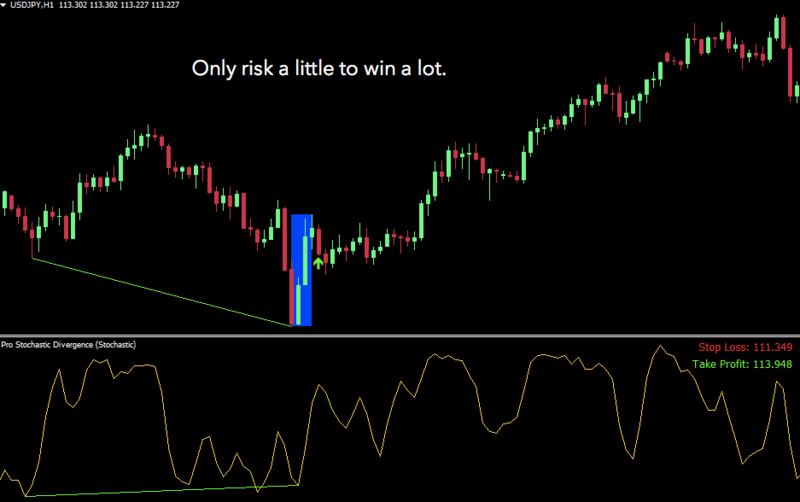 Our Stochastic Divergence Scanner takes care of it all. So you'll never miss out on another important trade. Further down this page, you'll notice there are TWO purchase options you can choose. You can get Stochastic Divergence Scanner indicator alone for an insanely generous price I'm giving the first 200. Or... you can invest a little more and get the Dashboard Pro package. So What's Inside The Dashboard Pro Package? First off, you get the Stochastic Divergence Scanner indicator. And on top of that, you'll also get access to the ENTIRE collection of ALL of our flagship DASHBOARD indicators. Including Harmonic Dashboard, Day Trading Dashboard, Wolfe Wave Dashboard, Stochastic Divergence Scanner, Candlestick Dashboard, and more. 67% Off The Regular Price When You Grab Pro Stochastic Divergence Indicator Today. But during this launch, you can grab it for just $99. It's 67% OFF if you take action quickly. And if you decide to invest in the Dashboard Pro membership, you'll also get a crazy 50% OFF today. When the clock strikes midnight on Feb 25, we'll be closing it down. Please don't email our support team if you're too late. No exceptions can be made. 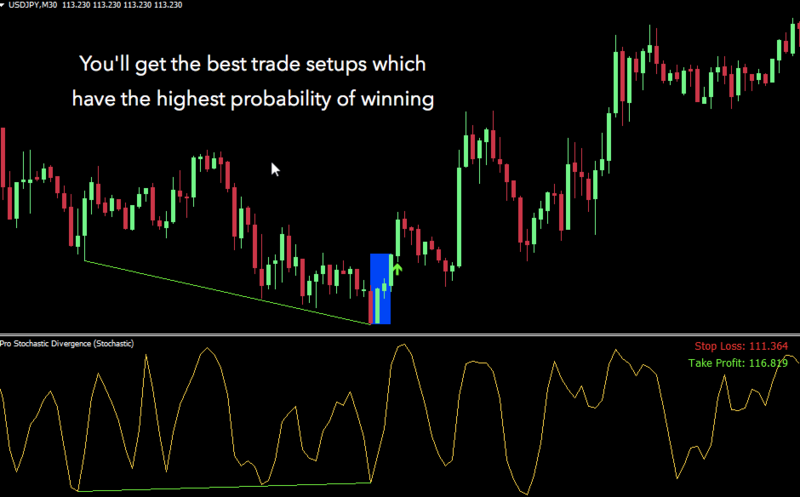 Get Stochastic Divergence Scanner only.